30/12/04 Well the last foal of 2004 has now been weaned, Runshaw Bendith Mai! 29/12/04 Well the 3 foals below have actually been weaned today, all went well and their dams Standwell Heidie, Standwell Selina and Thistledown Walnut along with Standwell Black Fashion have gone onto fresh grazing for the winter, all settled and happy. Its far easier when they are left on longer and almost wean themselves. The rest of the mares and fillies will be moved to their winter quarters at the weekend and then all done and settled until Spring. 13/12/04 Well the remaining 3 foals came in today with their dams in preparation of weaning. All will be done and before the New Year at this rate which is quite an achievement for me!!! 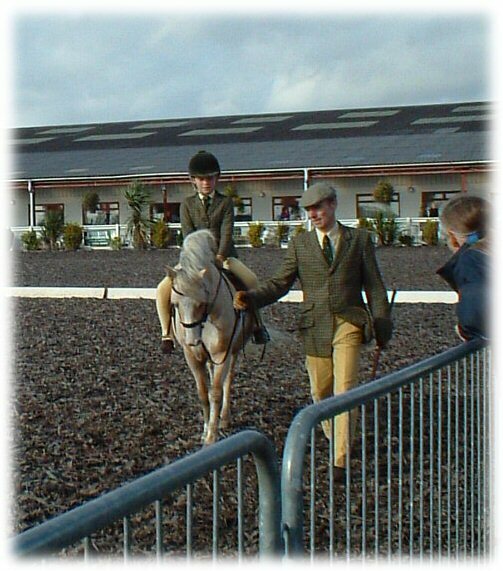 12/12/04 Well Runshaw Cariadog went to Devon today, we'll really miss him but can;t wait to see him out under saddle!! 08/12/04 Well we had a trip today to Roma Hunter of the Crabbiesden Stud in Perth today to deliver her new colt foals. From here she has Runshaw Lucifer and Runshaw Romeo and we also took up Barracks Cardinal and Fosterhouses Casanova. All travelled fantastically well and were very settled and happy 5 hours later when they arrived in their new home. Lucifer has taken a shine to Roma's big Cob mares and really can't understand why they can resist his charms!!! We also returned home with Runshaw Cariadog who Roma had kindly collected for me and he is now back here until his new owners the Cherrytop Stud from Devon come for him on Sunday. His future now is to be gelded and come out under saddle on the County circuit like his half brother so very excited about another under saddle in the show ring in the future!! 01/12/04 Well Christmas is almost here and we have got a sparkly revamp to the website as you've probably seen! We have also started to wean some foals too Anwen, Ladi Lilleth, Romeo and Lucifer are all currently in with their dams and will be slowly weaned over the next week or so. All look fabulous and made big strapping foals so very pleased and some should be off to their new homes very soon. Then once those are settled and sorted the last ones will be done which are Seren Aur, Heddwen , Welsh Poppy and Bendith Mai and hopefully all done before the New Year! Once again the little star has been out!!! aka Runshaw Andreas! Judged by Kevin Walker of the Brynoffa stud he was placed 1st in the Nupafeed Nov M&M Lead Rein and 1st in the Colne M&M Lead Rein !!!! What an absolute star this pony is turning out to be and what a fabulous future he must have before him!!! 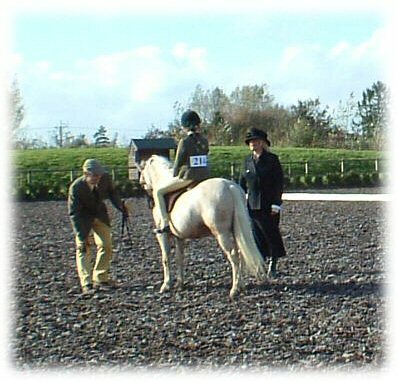 1st BSPS Novice M&M Lead Rein Mrs Bevan Jones ?????? Thank you once again to the Rushton Family for doing such a fabulous job with "Storm" can't wait to see him in the ring in the flesh!! 23/09/04 - 26/09/04 Fayre Oaks 2004 and the Polaris dispersal sale. Well with a lot of consideration we took Pinfold Barnwr to the Rhydgwillim stud owned by Mr Reg Bowen. He is there to run out on the hill and to hopefully with a group of mares and are sure this is the life "Jack" has craved for. He certainly seemed full of himself shouting to his new neighbours while disappearing up a welsh hillside, can't wait to hear updates and hope he realises he is in Welsh pony heaven!! The sales saw me being very well behaved and the only thing i bought was a new rug for old Coed Coch Barnwr, i didn't even buy anything at the Polaris sale either!! There were some fabulous ponies there that were an absolute credit to the late Countess of Dysart and her Section B's were of the likes you'll have to go a long way to see again, bone, substance, type and fabulous action!In particular the stallion Polaris Euros, i stood in absolute awe of him both in his stable and out!! And the mares Polaris Elsie (dam to Euros) Polaris Choisya, Polaris Nasturtium and the beautiful old mare Seaholm Dawn, all of which proudly stay in the UK!!! 12/09/04 Well after a hair raising few days we are glad to say we have 2 new additions in the stud. Penwisg Sonnet, half sister to Penwisg Sior and Penwisg Helen and Penwisg Llewes. Both palomino by Coed Coch Ron, Sonnet being out of Coed Coch Sioned and Llewes out of Crossfoxes Llungwyn ( Bengad Nepeta x Coed Coch Lynne) both were part of a group of ponies of Penwisg prefix and Coed Coch breeding which i had tried to buy seperately or as a whole some time ago and again a few weeks ago but to no avail. Sadly a text message on my phone told me the others had been "disposed of" during the week and if i wanted the 2 palomino mares i had to collect them on Sunday and pay with cash or they would also be being "disposed" of on Monday morning aswell. Due to their breeding and being such beautiful old mares i simply couldn't let that happen!! A panicking phone call to Bekky Swift, again, as my horsebox needs some welding doing for its MOT we couldn't take ours but Bekkys brakes had just gone on hers so another frantic phone call saw the arrival of a Trailer on Sunday morning!! Just about to set off when we got a phone call to say some of the stallions had got out onto some stubble ground so we shot off over there and sorted those out and decided as we were going past the lane end we would return Churtoncroft Tecwyn and Churtoncroft Llwynog to Churtoncroft before the onset of winter and still be there to collect the mares as we had to be there by 1pm and they were only 10 minutes from there anyway! I think we broke land speed records from Churtoncroft tot he mares but we got them and were loaded by 1.20pm and heading back to Churtoncroft for a brew and a sigh of relief that the 2 lovely old mares in the paddock were saved from the bullet, sadly unlike their friends earlier in the week. Sonnet has been a mare i had wanted for some years but couldn't find and Llewes is to join her dam at the Fosterhouses stud in Yorkshire so smiles all around today and 2 very safe and sound old girls!!! 16/08/04 SUPERB NEWS!!!!! Cilio Ann the beautiful mare who visited Boss in May has been scanned 12 weeks in foal! Congratulations to all her family and hoping for the pitter patter of tiny hooves in April 2005!!!!! And what a very special foal that should be too, we can't wait !!! 11/08/04 Churtoncroft Hyfryd was today turned out over the road to join Pinina Roulette, Penwisg Helen, Standwell Black Fashion and the 2 yearling fillies Runshaw Hyfryd and Runshaw Ffantasi. She strutted her stuff for us, and boy can she move, and then settled quietly with the others after she introduced herself to them all and was soon mutual grooming everyone in turn! The trip went with the usual excitement of huge tail backs, roadworks and torrential rain and then baking sunshine on the way there and of course the directions flying out of the window which all added to the excitement!! A slight detour, due to the obvious lack of directions, and we arrived to collect her, again arranged unseen even though i keep saying i'm not going to do it again, and were very pleased. She travelled the huge journey back as good as gold without so much a peep from her and went straight into her stable to her haynet had a wee and that was that!! These Coed Coch bred ponies temperaments are just fantastic!!! 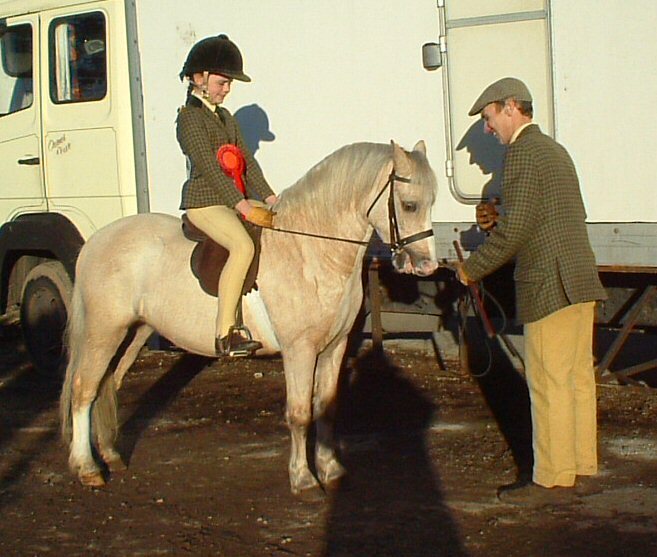 19- 22nd July 2004 Royal Welsh Show 2004, after an eventful start and the genorousity of our friend Bekky Swift of Hirondelle Natives we took our home bred colt Runshaw Hafog for the 3 year old class which we are delighted to say he stood a extremely creditable 10th in a good strong class and above some well known colts with far more miles under their belts than "Sox" as this was only his 3rd time away from home and the first time he had travelled alone and been stabled away from home. He went to the same show as a yearling and to the Coed Coch Open day for the WPCS Centenary Celebrations and has been in the field with the other colts ever since!!! We would like to give our heart felt thanks to Steve Williams of the Rhesfair Stud for showing him so well for us as nerves simply got the better of me and as he is my baby and maybe a little spoilt by me we felt he would maybe be better for a man to show as he would have more respect, this is still a decision that i feel was the right one but what a nervous wreck i was stood ringside watching my pride and joy in with the best of the best and the judge feeling he was worthy of standing on that illusive front row at the Royal Welsh!!! I still don't think its sunk in yet and to anyone who saw me after and congratulated me i'm sorry if i didn't seem enthusiastic but i was in an absolute daze and shock!!! I'm so proud of my lad and feel he will be a worthy stallion in the future to stand alongside my RWAS winner Churtoncroft Aries, maybe one day he'll join him in that status?? 09/07/04 Pinina Roulette seems to have held to Fosterhouses Supersam as she has shown no signs of returning to him!!! Lets hope he leaves his run of fillies too!!! All the foals are blossoming and i honestly feel they are the best batch i have ever bred i'm thrilled with each and every one of them! 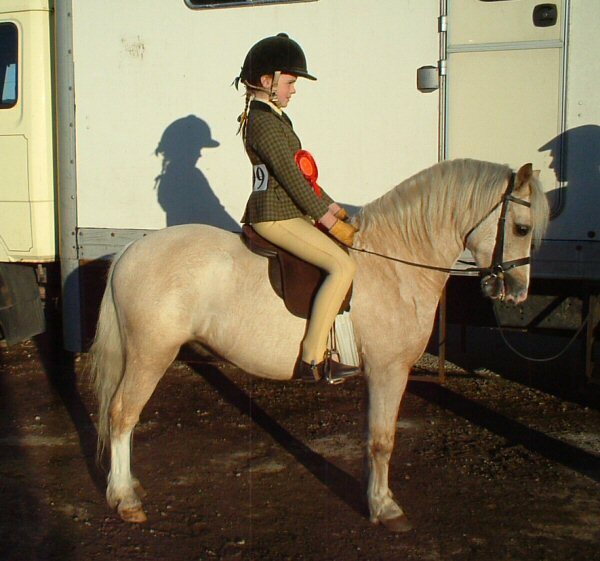 08/07/04 After lots of thought and discussions i have finally decided to sell Welsh Poppy aswell as Ladi Lilith to jet off to Dallas , USA next year to the lovely home of Scarborough Farm Welsh Stud , congratulations Beth they really are stunners and i know you will treasure them and appreciate what fabulous girls they are. Look out USA they are going to be a force to be reckoned with!!!! ONLY 2 WEEKS UNTIL THE ROYAL WELSH!!!!!! 30/05/04 Today we returned Coed Coch Atebiad to the Churtoncroft Stud and also took Churtoncroft Aries back for a few weeks to cover some mares too. While we were there i also arranged for the young mare i have had my eye on for years Churtoncroft Henderw and her best friend Churtoncroft Rhiannon to come home to the Runshaw Stud. We are over the moon that 2 lovely mares of irreplaceable bloodlines are coming to join us. There details can be seen on the mares page. 26/05/04 Thistledown Walnut and a lovely little visiting mare Cilio Ann (click on her name for her wonderful pedigree) have been covered today by Churtoncroft Aries so hopefully two more wonderful foals for next year. 25/05/04 Runshaw Lili Lon foaled in the early hours, a beautiful Chestnut roan filly with a big blaze and 4 long stockings! She is absolutely besotted by her new baby and this is the first Runshaw foal out of a Runshaw mare and has now been named Runshaw Ladi Lilith !!!! Not to be out done Cuhelyn Anna foaled just 10 hours later, after her breakfast of course, to Churtoncroft Aries and has had the most enormous and beautiful Chestnut filly, now named Runshaw Anwen! Both mares are doing well as are their daughters and we finally now have our foals of 2004 which comprise of 5 fillies and 3 colts and every one of them is a stunner!! This years crop of foals has certainly more than made up for the heart ache we endured last year, days like this make it so easy to know why we have all the sleepless nights!!! 16/05/04 Brynrodyn Camellia covered by Churtoncroft Aries and Standwell Black Fashion covered by Coed Coch Atebiad. 13/05/04 Pinina Roulette covered by Churtoncroft Aries again and Standwell Heidie covered by Coed Coch Atebiad ,fingers and toes crossed the old boy is still fertile! 12/05/04 CROSSWAYS BETTY HAS FOALED!!!!!!!!!!!!!!!!!!!! She has had the most beautiful Chestnut FILLY with what looks to be 4 whites socks and a narrow blaze!! She has been well worth the 7 year wait for her (or indeed any foal) and i would have been happy with anything but such a perfect filly is just outstanding, i'm still floating around on cloud nine and Abbey is made up that she has her own baby now to look after!!!! Pinina Roulette has been covered tonight by Churtoncroft Aries and Standwell Black Fashion, Brynrodyn Camellia and Cuhelyn Anna have come home too. Anna is due to foal in a month and the other mares will be covered by Aries and Coed Coch Atebiad when they come in season. 04/05/04 Chetwynd Lily foaled at 2am this morning, a beautiful bay colt by Churtoncroft Aries, now named Runshaw Lucifer his details can be seen on the foals page or by clicking his name. 02/05/04 Well Standwell Heidie has made the wait worthwhile by producing the most beautiful dark chestnut filly foal at 6.30am by Fosterhouses Supersam with 4 whites socks and a neat blaze!! Runshaw Heddwen can be seen on out foals 2004 page or by clicking on her name here. Now waiting for Chetwynd Lily who is due from today and is bagged up but not yet waxed up and Crossways Betty is starting to make quite a little bag now so huge exctiement. Runshaw Lili Lon is due the 3rd week in May and then finally Cuhelyn Anna is due in June for this year. 28/04/04 Standwell Selina has had the most stunning big palomino/Chestnut roan colt foal with 4 white socks and a big blaze by Churtoncroft Aries, details on the foal page or click her on his name- Runshaw Seren Aur , and Standwell Heidie is waxed up ready so another hopefully soon too!!!! 21/04/04 We have just heard the fabulous news today that Lacy Primula has had an absolutely beautiful Chestnut filly for the Birchcourt Stud by our boy Churtoncroft Aries, now named Birchcourt Debutante! Chetwynd Lily and Runshaw Lili Lon are now home in preperation for foaling next month. 18/04/04 Runshaw Rhyfeddod and Runshaw Seren Y Gogledd have been turned out for the summer now with the other stallions who have come off their Winter grazing and all have settled well. I am a great believer in stallions and colts mixing if at all possible and feel they are far better socialised this way and learn invaluable manners early on, just because they are entires shouldn't mean they live a solitary life and all mine with an odd exception (bought in later years and unsocialised) run together fine. Runshaw Hafog and Churtoncroft Rhodri have stayed inside in preparation for the Royal Welsh this year. They will be entered in the 3 year old colt class and the junior Stallion Class. The 2 Coed Coch Superstar mares Standwell Heidie and Standwell Selina have come home today in preparation for foaling in a few weeks time. Both look great and are really blossoming. These 2 foals are by Fosterhouses Supersam and Churtoncroft Aries and are very eagerly awaited! 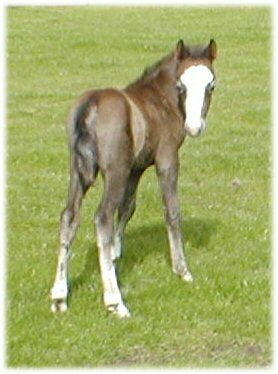 more pictures and pedigree now on the 2004 foal page or just click his name above. 24/03/04 The first foal of 2004 has arrived!!!!!!!!!!!!!! 21/03/04 Well we are currently waiting for the first Runshaw foal of 2004, Thistledown Walnut is bagging up well and is unsettled so anytime now , also Lacy Ruth is quite well bagged up and as we have no covering date for her just keeping a watchful eye. Thistledown Walnut always catches us un-awares as she hasn't read the book of foaling so is now on 24 hour cctv just in case! The rest of the mares are blossoming and will be coming home soon and the yearlings are growing well and making up to be lovely ponies. The stallions and colts are still running out and we are forward planning to this years coverings and shows so after a lazy winter it looks like its all go now!!! 04/03/04 The best sight i've seen for a long time! After 7 years of waiting i saw Crossways Bettys foal kicking today! In floods of tears of joy i rang Bekky who came around and although it had gone back to sleep with the old fashioned hand on the bottom of the belly she felt a few kicks!! So it official, CROSSWAYS BETTY IS IN FOAL TO CHURTONCROFT ARIES and due 11TH MAY!!!!!!!!!!!!! 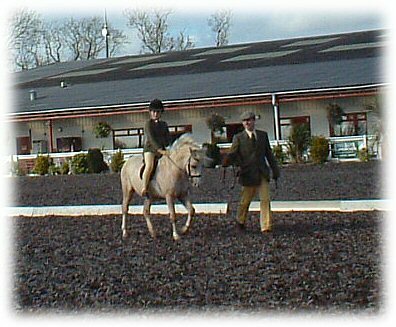 25-26/02/04 Myself and Bekky Swift went to South Wales looking at ponies. We stayed over night at Jo of the Maxcob Stud and had a wonderful time, and ..... it snowed!! So Thursday morning was spent making snowmen in Jo's back garden and having snowball fights! Great Fun!! Then we set off for our friend Steve Williams of the Rhesfair Stud to see his lovely Section A's, what quality ponies there are down there including the great stallion Sunwillow Pesaro and the lovely old mare running with him, Llanerch Brocade. While in the middle of the field watching Steves ponies being brought out by him for us i had a phone call (thank god for Mobile phones) that i had a mare at home down in the field wth Colic! Frantic phone calls then arranged a Vet to go to the field while i arranged my Mum to come out of work to meet the Vet with my Dad as we were a good 4 hours away! Penwisg Helen had gone down in the field and had been diagnosed with a Twisted Gut when she got home, pulse well over 80, red pigment to her eyes and gums, nothing in her hindgut, abdominal tap produced large amounts dark orange fluid with blood, in fact every sign of not looking good was there! But with a small painkiller and a relaxant she quickly settled and as we were on our way home and she was quiet no more decisions were made until i got home or she went down again. We arrived home to find a bright cheery mare picking at her haynet without a care in the world! We stayed up overnight (as we are lambing) so kept an eye on her and she was fine, we had droppings by 10.30am and she's never looked back! These Welsh Mountain ponies never fail to amaze me with their stamina and fight! 11/02/04 Brynrodyn Camellia, Runshaw Ladi Gwyneth, Penwisg Helen, Runshaw Heloise and Standwell Black Fashion all in season. 11/02/04 Following an incident with a third parties horses we fear Brynrodyn Camellia, Penwisg Helen and Standwell Black Fashion could have all lost their foals. As heartbreaking as it is they are thankfully all well in themselves and we'll look forward to the foals from the other mares. 25/01/04 All go here today! Churtoncroft Menna and Runshaw Welsh Honey went back to the other mares and youngstock today as Honey is now completely sound and was itching to be back out and Menna has gone to play out with her now that Lacy Ruth will be stabled in preparation of her foaling!! We also weaned the foals of 2003. The mares had weaned them themselves approx a month ago and we had hardly even seen them suckling but felt that it was time for some lessons and the mares to have more space. All went well, only Rhyfeddod made a bit of a fuss but he's always been a Mummy's boy anyway! All the mares are now on fresh grazing and are happy and settled. Its always so much easier on everyone if they are left to nature and wean them themselves, as much as i hate doing it even now at this age, i couldn't bear to wean them and hear them shouting to their dams and the dams to their foals when they aren't ready! I know i'm maybe soft but i have a building full of happy settled well grown foals/yearlings tucking into their hay and a field full of happy and content grazing mares and thats good enough for me. 19/01/04 Lacy Ruth and Churtoncroft Menna came in today. Ruth will stay in now on preparation to foal along with Thistledown Walnut. Menna and Runshaw Welsh Honey will go back out together with the other mares and fillies in the next few days when it stops raining! 07/01/04 Well Runshaw Welsh Honey decided to give us all heart attack today! After getting down to roll she couldn't put any weight on a front leg and had it at an odd angle. We got the Vet, who couldn't find any obvious breaks etc and put it down to a possible foot abcess or we think a pulled muscle in her shoulder as with box rest she is far happier and putting weight on it now quite happily and has a slight swelling on her shoulder too, daft filly, maybe she knew i had her earmarked for the youngstock classes this year! 04/01/04 Well here we are starting another year. The foals of 2004 seem just around the corner now as does of course the start of the 2004 show season which is now less than 12 weeks away!! We are also starting to plan the coverings for this year too with emphasis being made on using Coed Coch Atebiad on most mares while is he is still fit, well and hopefully still fertile. All in all a very busy time to come, including of course getting the foals of 2003 weaned which is top of the list! !